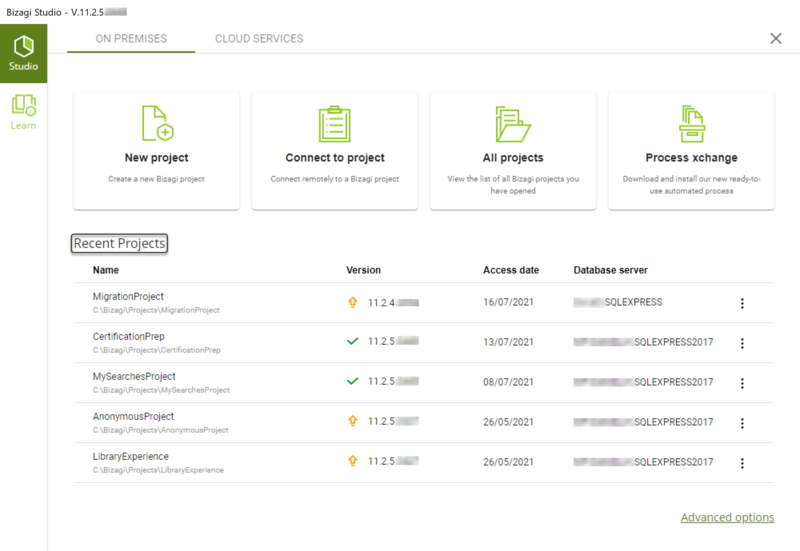 Although we recommend that you create your own backups of the project's environments, Bizagi automatically generates a backup of: the database, the Scheduler and the files used by the Work Portal before performing the upgrade. In the event of a failure to upgrade, Bizagi rolls back to and restores the state of the environment by relying on these backups. When you use the SQL Server Database remotely, the path for backups is usually set on the database server as: C:\Program Files (x86)\Microsoft SQL Server\[MSSQL_instance]\MSSQL\Backup\. In projects using Oracle as the Database, the backup path is as defined for that given Oracle instance (during initial project configuration) is the property BA_BACKUP_PATH. Always upgrade the development environment first. We recommend that you perform unit tests in the Development environment after you have completed the upgrade to verify that existing processes behave as expected. Once this is done, upgrade and perform user-acceptance tests for your Test environment. After verifying that processes work as they should in both the development and the test environment, and depending on how critical your processes are, you may create a production-replica environment. In Production-replica environment you can perform an upgrade and test your Production environment processes with live instances. After ensuring that the production-replica environment processes and instances function as they should, upgrade your real Production environment. 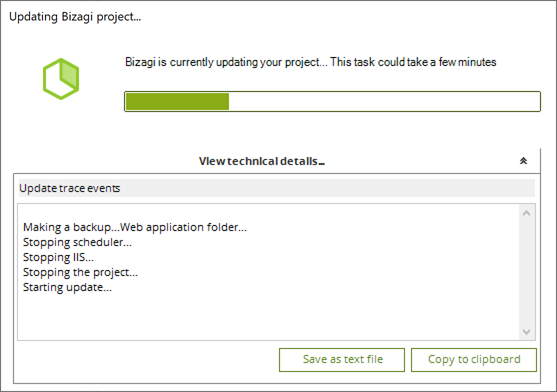 A Production-replica environment is a Bizagi project which has the production backup restored into it. It is not the real Production environment because Production parameters and other relevant information have not been modified to reflect the environment's location (for instance, the actual e-mail addresses of users, the SMTP Server or other URLs involved in integration points in the production, etc). If you have not yet deployed your project into a production environment, you may disregard this consideration. If your project has been already published into a production environment, upgrading your project in the development environment will eventually require that you also upgrade your project in the Test and Production environments. If you do not do this, you will not be able to carry out deployments to publish your processes. A version upgrade should be carried out with advance notice and coordination, so you upgrade the Bizagi servers, when team members are not working on the project. A version upgrade will stop services (for approximately three minutes). Before the upgrade, either apply the Release Candidate or cancel it. If you have doubts on this steps, please contact our support team. Here is the upgrade procedure for each environments. 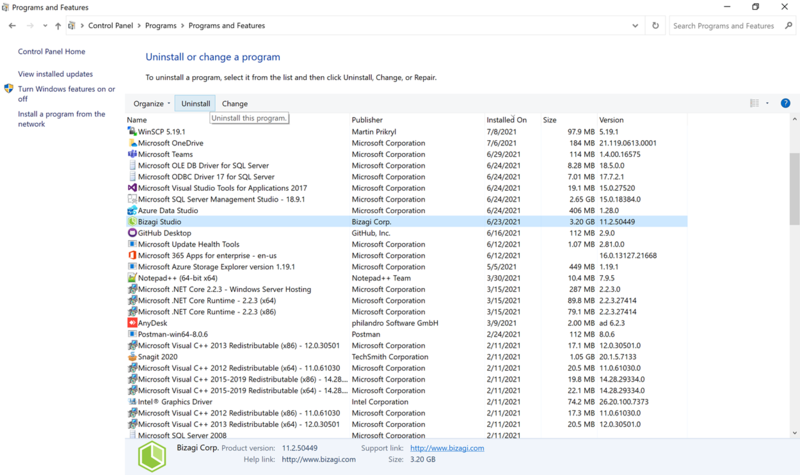 •Keep in mind that after upgrading the Bizagi Studio version, you should always reboot the host server. •If you haven't checked your project's metadata with our support team already, perform a backup of your project. Then create a ticket in our Support website and send your backup. This is so the Support Team can check your project's metadata thoroughly to help you with a smooth migration on your other environments. Once you have verified that your processes behave as expected in the development environment, you can upgrade your other environments (first test, then the production replica environment if you use it, and finally, production). Upgrade each environment following a similar procedure you used to update the Development environment, and with the same recommendations. •Make backups and plan and coordinate the upgrade. 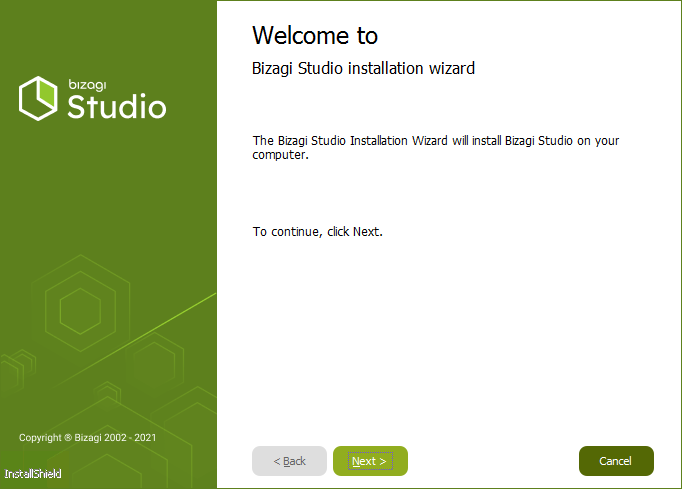 •Install the Automation Server release that matches the version of Bizagi Studio used by your development environment. 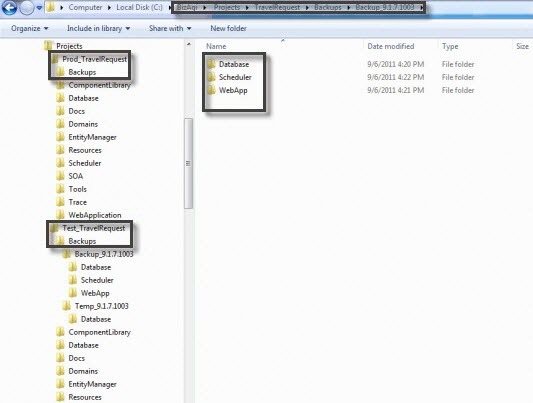 To install a newer release, first uninstall the current version, as described at Uninstall. Then install the newer version. After uninstalling or installing, you may need to reboot your server. •Once the newer version has been installed, upgrade the project using the Management Console. 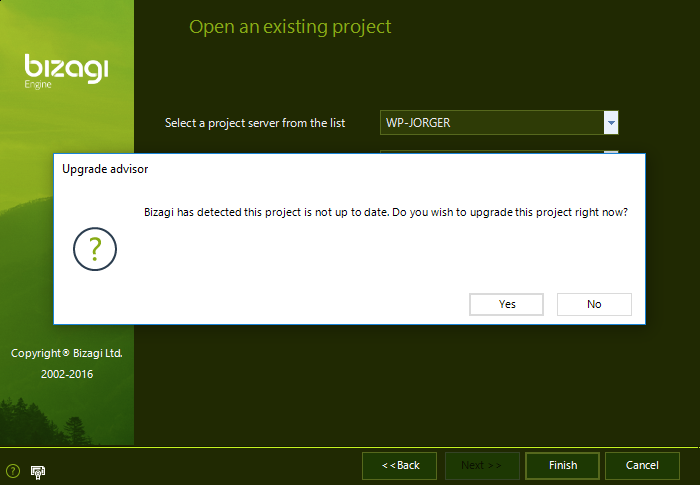 In the Management Console you are presented with a similar procedure to what you used to upgrade the project with Bizagi Studio. •Verify that your processes behave as expected. Complete this step only after confirming that user-acceptance tests had satisfactory results in your test environment. This procedure is the same as performed for the test environment. The same procedure also applies for a production-replica if you decide to set up such an environment. 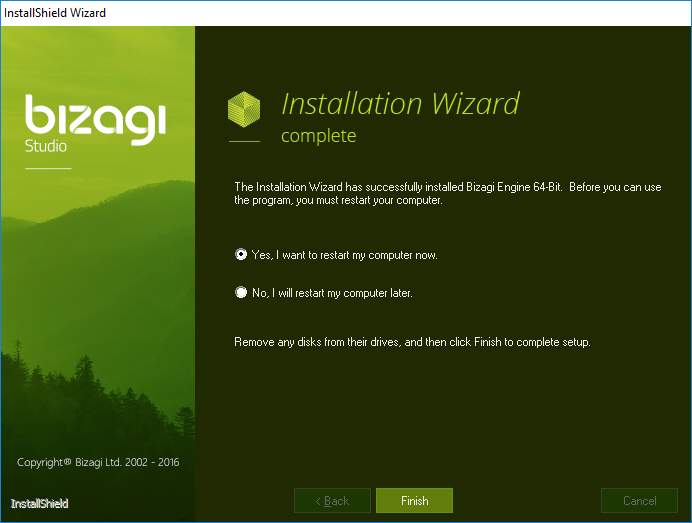 •Install the Automation Server release that matches the Bizagi Studio version used by your Development environment (by uninstalling the current version and then installing the newer one. and performing any required reboot). 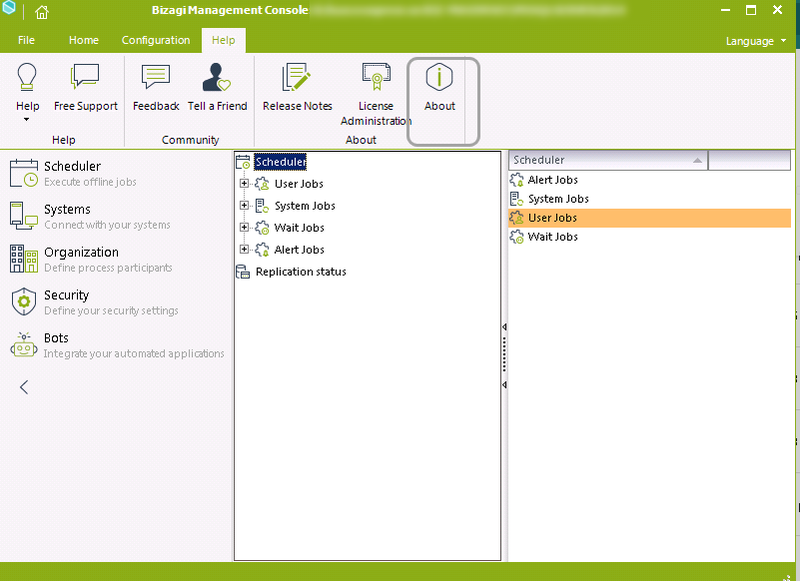 •Upgrade the project in the environment, using the Management Console.